From a German concert review in 1988: “Is it Jazz? Is it Voodoo? It doesn’t really matter, as Sharp Wood’s music is world-music, that is understood everywhere.” Finally Michael Baird knew what he was playing: he was playing Voodoo-Jazz! From the outset, Sharp Wood concerts had a ritualistic character, driven by exorcistic drumming. The group existed from 1984 to 1994, from duo to trio to quartet, one of Holland’s first world-music groups – ten Sharp Wood years of idiosyncratic music, a mix of Africa, Europe, and jazz. This cd is a compilation of the three albums by Sharp Wood (SWP 001, 002, 003), with the tracks now remastered by Zlaya Hadzic in 2017 and sounding fresher than ever. Total time 69'45. 16 page booklet. Tracklist: 1. Herbal Event, 2. Sambé, 3. Eeway, 4. Randjes, 5. Disco 3000, 6. Echo Song, 7. Earthcake, 8. Camel Walk, 9. Wazza Time, 10. Mutende, 11. The Legend Of Sleep, 12. Prélude Contemplatif. 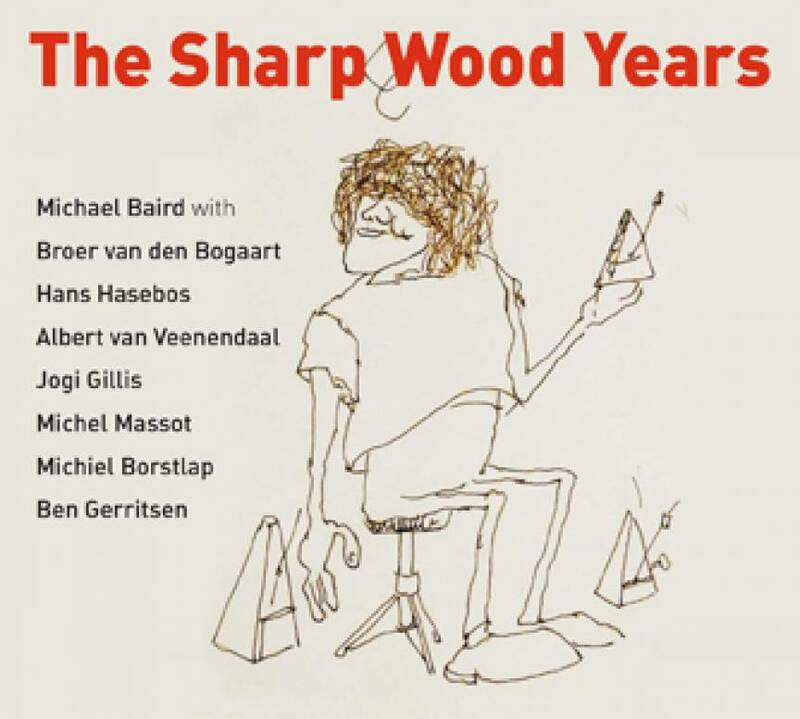 The video features the Sharp Wood percussion duo, with performance artist Ralph Wingens, in 1985. Desertjazz 2017 (JP): ヒュー・トレイシー復刻とザンビア等でのフィールド録音で知られる SWP が初期音源をコンパイル。主宰者マイケル・ベアードのポップで実験的なジャズが楽しめる。"SWP Records has released The Sharp Wood Years cd to celebrate their 30th Anniversary. I enjoy Michael Baird's early playing recorded almost 30 years ago. His jazz music sounds experimental, primitive and pop, and also has a latin flavor. Congratulations, Michael!" Jazzflits 2017 (NL): "In 1984 nam niemand het woord 'wereldmuziek' in de mond, maar slagwerker Michael Baird maakte het al. De composities van Baird, met zijn diepgeworteld besef van ritmiek, die verder gaat dan Afrika alleen, zijn nog even urgent als in de late jaren tachtig en vroege jaren negentig. Een vertellend stuk als 'The Legend of Sleep' staat als een huis." "In 1984 nobody yet used the term 'worldmusic', but drummer Michael Baird was already making it. The compositions of Baird, with his deep understanding of rhythm, which goes further than just Africa, are still just as urgent as in the late eighties and early nineties. A narrative piece such as 'The Legend of Sleep' is as solid as a house." MixedWorldMusic 2018 (NL): "Deze Voodoo-Jazz werd niet gemaakt als onschuldig tijdverdrijf of amusement, maar als een soort spirituele beoefening, bijna als sacrament." "This Voodoo-Jazz was not played as an innocent pastime or for amusement, it was a sort of spiritual exercise, almost a sacrament." Jazzism 2018 (NL): "Baird is in de eerste plaats percussionist, dan pas jazzmusicus, zodat vanaf de eerste album uit 1987 invloeden uit de afrikaanse muziek maar ook de rock een belangrijke rol spelen. De stukken van Sharp Wood hebben door de jaren heen met elkaar gemeen dat de structuren helder zijn, terwijl er ook bijna altijd een element van verdichting met strakke syncopen in zit. De muziek klinkt daardoor nog even actueel als toen ze nieuw was." "Baird is a percussionist in the first place, only after that a jazz musician, so that from the first album from 1987 onwards, influences from African music but also rock have a major role. The Sharp Wood pieces over the years have in common that the structures are lucid, while there is also nearly always an element of densification with tight syncopation. This makes the music sound as up-to-date as when it was new."